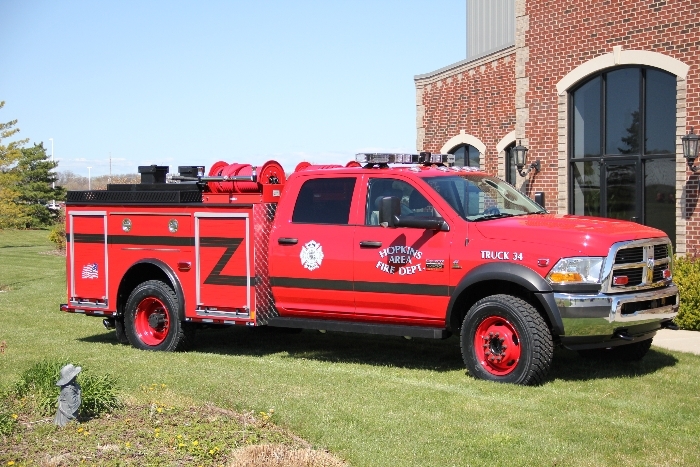 Spencer Manufacturing is proud of this tough looking equipment truck purchased by Hopkins Area Fire Department of Hopkins, Michigan. This truck got a lot of attention at FDIC in 2012, and it is easy to see why. 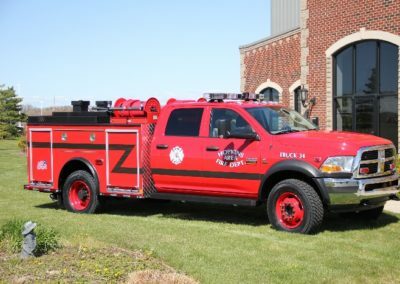 The tough look and the sleek features of the all custom black anodized running boards, rub rails, and storage baskets got the attention of firefighters across the country. 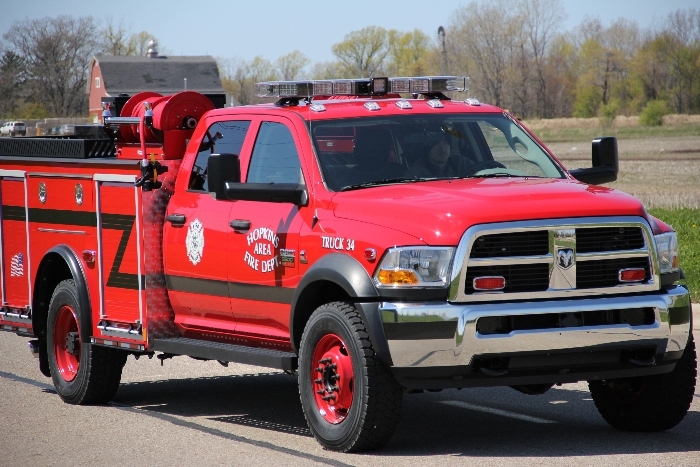 This 2012 Dodge Ram 5500 is equipped with 19.5″ powder coated single wheels with an APR Poly body and built-in 250 gallon tank, mounted on a Spencer aluminum sub-frame. 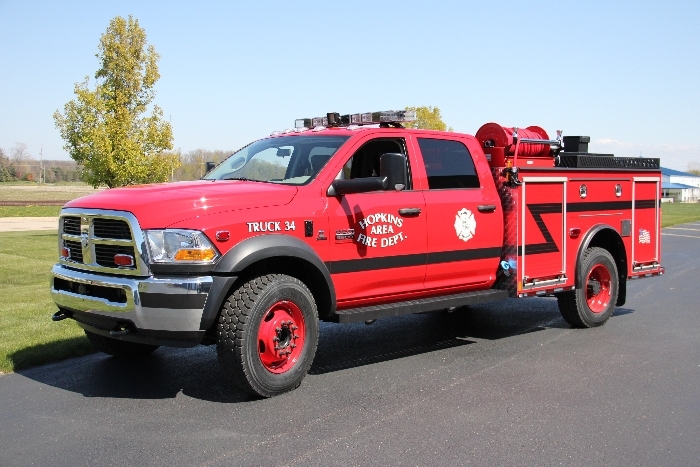 This truck demonstrates the engineering and design capabilities of Spencer Manufacturing combined with the industry leading Poly fabricating of APR. 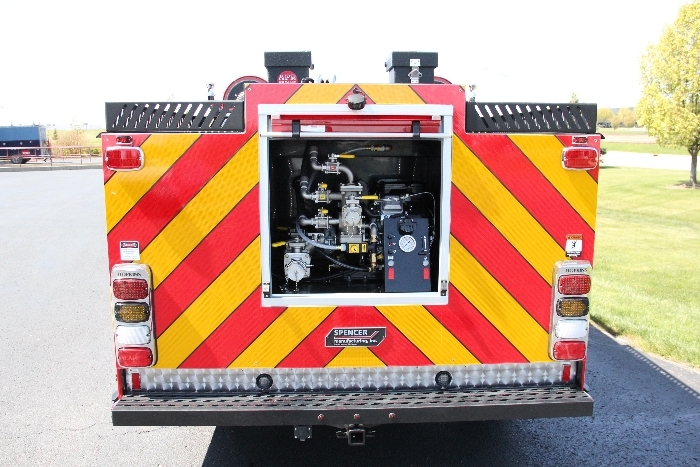 The pump controls in the rear compartment are powered by a Hale HPX200 Pump with Scotty Foam System and custom stainless manifold with Class 1 valves. Additional features are Whelen Warning Lights, ROM Roll-Up Doors, and Roll-Out Trays by Innovative Industries. 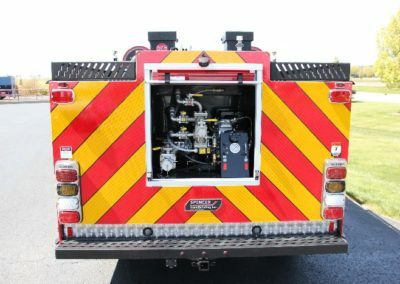 For quick attacks there are two Akron Brass Booster Reels deployable from both sides of the truck, as well as four electrically operated bumper nozzles. Weighing only 13,000lbs loaded, this truck is truly a quick attack truck that any fire department could utilize.